I’ve spoken internationally to tens of thousands of people across dozens of industries about productivity, creativity, passion for work, leadership, and how to unleash everyday brilliance. To inquire about having Todd speak at your event, contact us. I teach people and teams how to be prolific, brilliant, and healthy. I believe that audience members at the 40+ events I speak at each year should walk away with specific, concrete ideas they can immediately implement to make them more effective. Because of this, my keynote topics focus on concrete practices that lead to sharper focus, improved productivity, and better collaboration. I can customize each talk for the audience, and can also develop a custom talk for certain occasions. In addition to my keynote topics, I also conduct a number of workshops through Accidental Creative. These are more intensive half and full-day interactive sessions designed to help teams be prolific, brilliant and healthy. I am there to serve you and the mission of your event. If there is any way I can add value, I will do everything I can to help make the event a success. Leading highly creative people, who are doing highly creative work, is a difficult challenge. However, the upside to getting it right is huge. 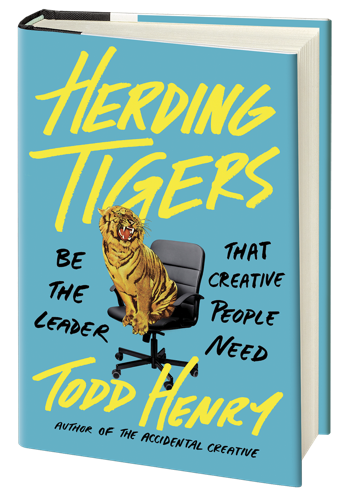 In this talk, Todd Henry shares the core things talented, creative people need from every leader, the common places where leaders unknowingly fail to provide them, and the handful of conversations, practices, and rituals that can set you and your team up to do its best work every day. Why every team needs stability and challenge, and how to diagnose which your team needs more of. The three ways that leaders forfeit trust, and don’t even know it. How to establish a leadership philosophy that builds clarity and trust. How to shape and prune your culture, and create an environment that talented people love to work in. Why most brainstorming sessions are ineffective, and how to do them differently. No matter how talented and driven your team is, there is always a danger of getting stuck in ruts. You have to be mindful of some of the common areas where even the most focused and successful teams eventually trip up, and build practices to help you avoid them. In this talk, you will learn a practical process for recognizing those “watch points” organizationally, identifying personal and organizational passion areas, and ensuring that the people in your organization are bringing their best focus and energy every day. The seven “deadly sins” that lead to organizational stasis. How to avoid aimlessness, especially in busy times. Why “ghost rules” can limit your organization’s productivity. How to identify core personal and team passion areas. Tools for defining your battle lines and building your daily activity around them. Tactical questions that help you surround problems and avoid “busy boredom”. How daily choices build a body of work that you’ll point to with pride. purposeful practices you can set yourself up to have great ideas, even under pressure. Learn the basics of life and work rhythm, and how to build an infrastructure that supports your personal and team creative process. How to spot the three assassins that rob people and teams of creative firepower. How to build predictable rhythms and practices that unleash your best work. The elements of rhythm (focus, relationships, energy, stimuli, hours). How to use challenges and “the big 3” to gain focus for yourself and your team. The five kinds of conversations you need to have for healthy collaboration. How to prune and manage your energy. The kinds of stimuli that lead to brilliant ideas. How to avoid the “efficiency trap”, and invest in long-term effectiveness. and attention. The key to making your work speak loudly and resonate with others is to uncover, develop, and then bravely use a voice rooted in authenticity. In this talk you’ll discover how to develop the core drivers of an authentic, resonant voice (authencity, uniqueness, precision, consonance, empathy, timing), and why some voices connect deeply while others simply miss the mark. You’ll also learn why your most resonant work results when you are mindful of three key factors: what you care about, what your audience cares about, and ideas already gaining momentum. Those people and teams who are brave enough to cultivate an authentic voice are impervious to cultural noise. They are the ones who change the game and resonate deeply with their intended audience. Why authenticity is more important now than ever for leaders and creative pros. The three drivers of the Voice Engine (Identity, Vision, Mastery). The six markers of resonant voices (authenticity, uniqueness, precision, consonance, empathy, timing). How to build “dailies” that build skills and improve your ability to connect with others. The questions that help you refine your personal passion areas. How to define your Intended Audience, and refine your vision for serving them. The specific steps involved in cultivating empathy in your work. Lack of effective collaboration kills teams, but it’s easier to default to old habits and familiar systems when the pressure is on. If you want to do brilliant work, you must understand why collaboration breaks down, and what to do about it. In this talk, you’ll learn how to effectively engage in conversation about process, gain a better understanding of your co-workers’ motivations and goals, and how to set yourself up for long-term success in the marketplace of ideas. The three unhealthy dynamics that cause teams to go off the rails. How to spot unhealthy habits and “relational residue”. How to lead a team through a project, and establish accountability and clear expectations. The five conversations that lead to brilliant collaboration. How to refine the team’s focus by establishing clear challenges. Want to share my topics with others? Feel free to download this PDF.